In the last century, the number of Americans over the age of 65 has increased nearly tenfold. This distinct population growth can be attributed to the modern quality of life as well as modern medical technologies. With people over 65 living longer, it brings up the unavoidable discussion of where the best place for you to grow old is; your home, or in a nursing home. While talking about growing old is never comfortable, it is an important thing to do because nobody wants to get caught off guard without a place to live when your health inevitably declines. Studies show that more than 90 percent of seniors want to stay in their home for as long as possible. With Best In-Home Care LLC, staying in the comfort of your own home is now possible. With home care services you can expect a couple things right off the bat. You will be comfortable, and you will feel at home. 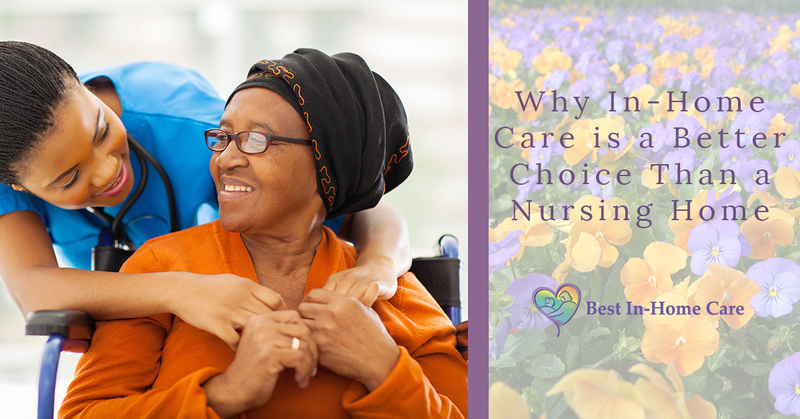 Unlike live-in care facilities, you will be able to experience a sense of independence and familiarity, both very important aspects that contribute to overall happiness. People that experience the familiarity of their own home during care are 25 percent less likely to visit the doctor than those at live-in care facilities. In fact, people returning to their home after hospitalization are associated with longer lives and a lower risk of rehospitalization. In-home care can also save you money after a visit to the hospital. According to the Journal of the American Geriatrics Association, when a senior returned to their own home after heart failure is likely to have 35 percent less medical bills than someone returning to a live-in facility. The most convenient part of receiving your care at home is that you don’t have to go out of your way at all. You’ve worked hard your whole life, it’s time that you let someone else do the hard work for you. Kick your feet up and relax. With home care services, you are less likely to be hospitalized, or re-hospitalized once you get to leave. By staying home, you are actually avoiding a huge amount of bills while living in the freedom and comfort of your own home. If you care about your independence but know that you need help contact us at Best In-Home Care LLC. It is our goal to help you maintain your independence for as long as possible in the comfort and familiarity of your own home.